FBI Dir­ect­or James Comey ac­know­ledged Wed­nes­day that de­term­ined ter­ror­ists and crim­in­als will al­ways have ways to hide their com­mu­nic­a­tions from the gov­ern­ment. Even if Con­gress re­quires U.S. tech com­pan­ies to guar­an­tee ac­cess to their devices and ser­vices, there will likely still be for­eign com­pan­ies that of­fer strong en­cryp­tion, Comey said dur­ing a Sen­ate Ju­di­ciary Com­mit­tee hear­ing. And soph­ist­ic­ated ter­ror­ists could even build their own en­cryp­ted mes­saging apps, he ad­mit­ted. En­cryp­tion scrambles com­mu­nic­a­tions, leav­ing only mean­ing­less gib­ber­ish to any­one who doesn’t have the right “key” to un­lock the mes­sage. 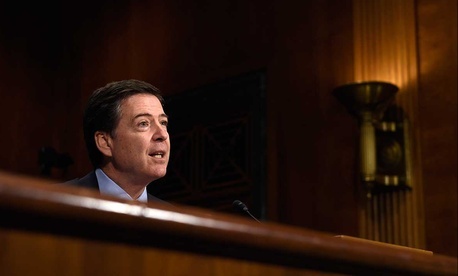 The ad­mis­sion may seem to un­der­mine Comey’s push for broad­er gov­ern­ment ac­cess to data. But, ac­cord­ing to the FBI chief, even though there’s no per­fect solu­tion, it’s still worth mak­ing it harder for ter­ror­ists to es­cape sur­veil­lance. Comey first began warn­ing of the prob­lem of crim­in­als us­ing en­cryp­tion to “go dark” from sur­veil­lance in a speech last year. Com­pan­ies shouldn’t of­fer ser­vices that make it im­possible for them to re­spond to war­rants or oth­er leg­al or­ders for in­form­a­tion, Comey has been ar­guing. The re­cent ter­ror­ist at­tacks in Par­is and San Bern­ardino have cre­ated mo­mentum on Cap­it­ol Hill to try to ad­dress the is­sue. But tech com­pan­ies and civil liber­ties ad­voc­ates ar­gue that en­cryp­tion makes the In­ter­net more se­cure. Any law re­quir­ing weak­er en­cryp­tion would make it easi­er for ma­li­cious hack­ers to steal sens­it­ive in­form­a­tion, they say. Comey dis­missed that ar­gu­ment Wed­nes­day. “It’s not a se­cur­ity is­sue. It’s a busi­ness-mod­el is­sue,” he said, ar­guing that con­sumers should pres­sure tech com­pan­ies to help the gov­ern­ment catch crim­in­als and ter­ror­ists.